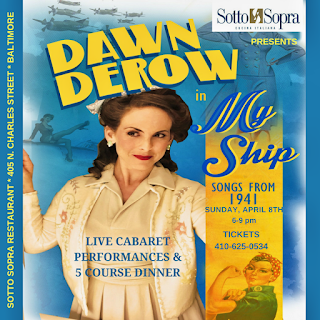 Cabaret at its best – MY SHIP has won accolades from New York City audiences this past fall and for a “one night only” performance, singer extraordinaire Dawn Derow and her pianist, Ian Hermann, will perform the award winning show at Sotto Sopra Restaurant. Step back in time and listen to Dawn Derow’s renditions of 1941’s Hit Parade interspersed with a five course, fine dining Italian dinner from Sotto Sopra. Tapping into the top hits of 1941 with songs like "Chattanooga Choo Choo", " Boggie Woogie Bugle Boy" and "The White Cliffs of Dover," Dawn Derow's "My Ship" explores the emotional climate of America as it entered WWII and opens our minds and heart to the women of that era, whether they were a 'Rosie the Riveter', a housewife raising children alone, a USO entertainer, or a nightclub singer. Derow revisits the music that comforted and uplifted a nation until there was peace "At Last." DAWN DEROW: A graduate from Boston Conservatory with a degree in Music: Vocal Performance & Opera Emphasis. Since moving to New York, she has performed in various clubs such as Birdland, The Metropolitan Room The Cutting Room, Don’t Tell Mama, The Friar’s Club and Carnegie Hall, as part of “Cole Porter’s 125 De-lovely Celebration.” Dawn won a 2015 MAC award for her work in the duo show REVOLUTION. Her album MUSIC 4 TWO with guitarist, Sean Harkness won for her a 2014 MAC Nomination for album of the year and in 2016 Bistro Award for Outstanding Vocalist for LEGIT: a Classical Cabaret. IAN HERMAN: He began his musical career studying classical piano. At the age of thirteen he was a guest soloist with the Pittsburgh Symphony Orchestra. After attending Manhattan School Of Music, Ian began working with performers including Jane Olivor, Donna McKechnie, Anita Morris, Judy Kaye, Tom Andersen, Karen Mason, Sharon McNight,Marilyn Sokol, Angela LaGreca, Carole Demas, and Joy Behar in nightclubs in New York and around the country. In 1999 he received the Backstage Bistro Award for best Musical Director. He was a pianist and vocal coach at the Broadway revival of Grease, working with guest stars such as Al Jarreau, Jon Secada, Sheena Easton, Chubby Checker, and Darlene Love. His other Broadway credits include “Jelly’s Last Jam”, “The Who’s Tommy”, “Song And Dance”, and “Swing”, for which he wrote vocal and dance arrangements. and “Laughing Room Only” with Jackie Mason. Recently he performed a concert with guitarist Sean Harkness, celebrating their new CD “DUET”, consisting of all original music.